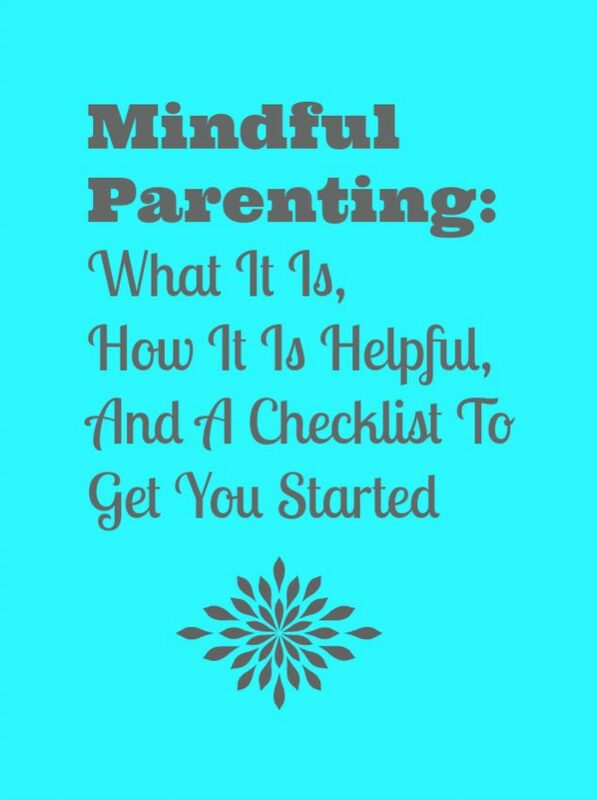 Today I want to share with you a Mindful Parenting Checklist. While I don’t think you will use this checklist every day, I do think you will find it useful to use for about a week to help you get into a better routine and then maybe once a week for awhile to help make sure you aren’t forgetting anything. The idea behind this Mindful Parenting Checklist is to help you adopt some useful new parenting habits that will make your life less chaotic and your family time more purposeful. Before, I jump into the Mindful Parenting Checklist, I want to answer the basic question, “What is mindfulness?” According to Jon Kabat-Zinn, Ph.D., who credited with initiating the popularity of mindfulness in the West, “Mindfulness is actually a way of connecting with your life…paying attention on purpose in the present moment, non-judgmentally.” It is basically the idea that we need to be more in the present, paying attention to the moment, rather than worrying about the past or the future. It is a way of being focused around awareness of the current time rather than anxiety of the future or depressive rumination. If that was too much of a mouthful, mindful parenting, in its simplest terms is about an awareness of your needs and your child’s needs in the present moment and staying focused on that. It is rather a slowing down of your thoughts and almost a cleansing of your thoughts. It is about thinking less and panicking less and being there in the moment for yourself and your child more. To begin mindful parenting, you may find it useful to write a personal mission statement and determine what is most important to you. Basically, we can all get caught up in the hectic schedules and stress of daily life but practicing mindful parenting can help make life calmer, happier, and healthier. We can turn a moment of stressed out panic to get out the door and anger at the kids for not being ready to speaking and moving in a purposeful way that communicates our expectations without panic, stress, judgement, and fear. Mindful parenting will still encounter times of conflicting needs but because of your connection to the present moment for you and your child, your actions and words will likely have more kindness and wisdom in them. The Mindful website, reports that,”according to new research, children who experience mindful parenting are less likely to use drugs or get depression or anxiety.” It is generally agreed that mindfulness and mindful parenting are successful at promoting well-being in several ways. “To bring mindful attention and awareness into your interactions with your child really seems to set the stage for you to be a good parent,” says Justin Parent. Here are some ideas to help you become a more mindful parent. I have presented them in checklist format so you print it out and go over it occasionally because we all know that it can be hard to remember everything and to implement new habits. The Mindful Parenting Checklist will help you make the progress that you want to make. Establish a daily mindfulness practice for you and your kids such as sitting in simple meditation for 5-30 minutes every day. Bring awareness to your breathing and sustaining it over time. Mindfully manage stress. Just taking a slow, deep, intentional breath can allow you to pause and refocus your attention on the present. Be mindful of what’s unfolding in your life and your children’s lives. Honor your needs and their needs as best you can rather than getting mindlessly caught up in reactions to surface behaviors. See your children as they are, not as who you want them to be and meet your child with more acceptance. Cultivate kindness and compassion in the moment for yourself and for your child. Be in the present with open-hearted, non-judgmental attention. Be less attached to outcomes. Mindful parenting should include listening carefully to a child’s viewpoint even when disagreeing with it. Again this Mindful Parenting Checklist is intended to help you implement new habits. It is not something you should stress over or try to check off every box every day. It is something to use as reminder to slow down and be present in the moment. 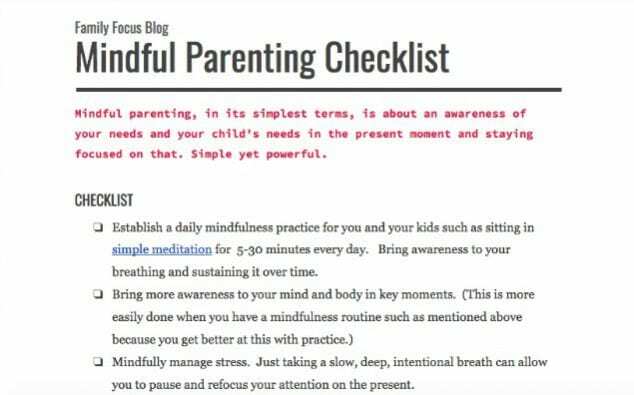 The image above is a partial capture of the full printable Mindful Parenting Checklist. You can go to google documents and print the whole page there. It has happened to all of that we find ourselves going through the motions. As your child talks to you, your attention may wonder and you are off thinking about the stuff you need to get done instead of enjoying the experience of being with your child and truly listening and responding with joy, humor, or just true attention. Mindful parenting isn’t just for when things are going wrong, it is for when things are going right too! It is being there in that moment and giving your child your full attention. It seems so basic but in this multi-tasking, multi-device, over-stimulation world, we have to get back to basics sometimes. Your child wants your attention more than anything else. In fact, we all appreciate those moments when a person is truly giving up their full presence. So tonight, when you tuck your child in, try mindful parenting and put aside your worries and preoccupations and just enjoy your exchange with your child. When you look at them, really see them. When you listen, really listen. And when you tell them you love them, think about how much you really mean it. I bet you enjoy mindful parenting! It feels good. What a wonderful and thought-provoking blog. 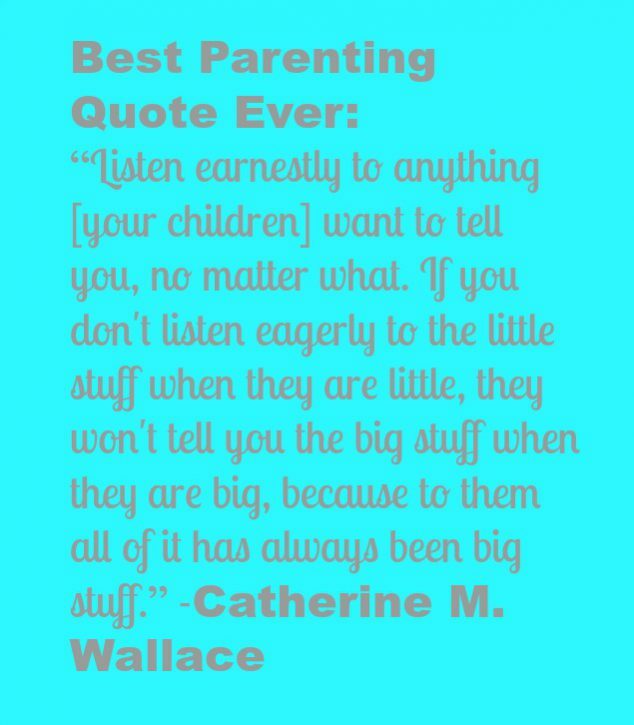 Be present, listen earnestly…the quote from Catherine Wallace is absolutely spot on. We were just listening to a discussion about some schools introducing mindfulness for children- I couldn’t agree more with that idea. Thank you for sharing your thoughts! Your blog just changed an interaction with my 2 year old from my threatening to take away his toy if he hurts his baby sister, to practicing calling Mommy for help if she’s starting to mess with his stuff. You’ve blessed my day. Thanks so much. And you have blessed my day with your kind words:) Thank you.